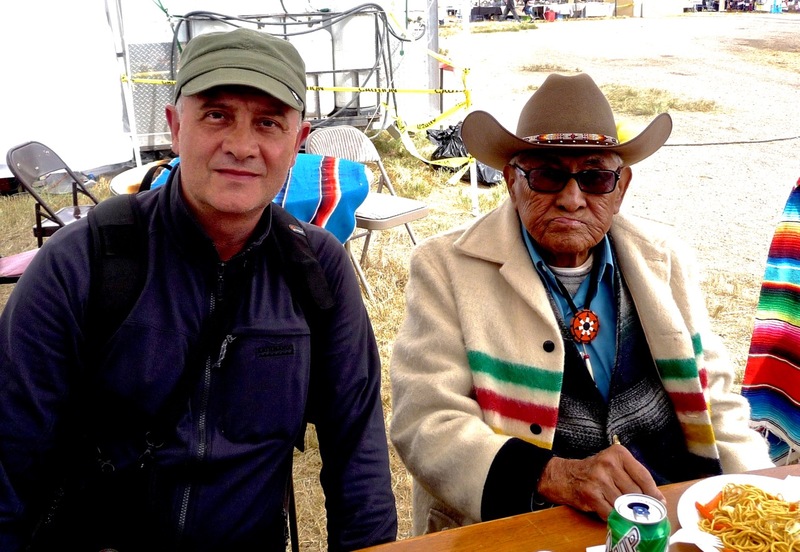 It was sad news the other week when I heard that my dear friend Joe Medicine Crow passed away at a Billings Hospice at the age of one hundred and two years old. I first meet Joe after the completion of the Crow fair Parade in 1995. And we bumped into each other agin during my next four road trips from 2006-2010 when I was visiting the Crow Reservation in southeastern Montana. After lunch at the Custer Battlefield Trading Post in 2006 Joe and I created some fine imagery together on the trading post porch. And I preserved three of these images in the Great Plains: The American West film collection later that same year. One of the deleted film images of Joe from 2006 will be the fifth and final image selected by myself and Florida based artist Denny Karchner to be painted later this year. Denny and I spoke about painting Joe’s image a few days after his passing and we both agreed it would be a nice way to honour this amazing man and his life journey. When I was curating the wall text for my Powwow: Native American Celebration photographic exhibition in 1999 I asked permission from Crown Publishers in New York City if I could use five quotations from Joe’s book “In The Heart Of Crow Country” for text to be included under images of Crow powwow dancers. Joe was the last link to the Battle of the Little Bighorn in 1876 and the last surviving war chief of his tribe. During his life Joe kept the history of the Crow people alive as he recorded the oral stories passed down to him by the elders. Joe’s step-grandfather White Man Runs Him was one of six Crow scouts who rode with Lt. Colonel George Armstrong Custer and his ill fated Seventh Cavalry as they attacked the large Lakota-Sioux and Northern Cheyenne encampment located in the valley of the Little Bighorn (Greasy Grass). Joe served in the United States Army during World War II and he was bestowed the honour of war chief after he sneaked into a German camp and after hand to hand combat with a young German soldier he counted coup without killing the soldier which was the highest war honour for a warrior. He then managed to steal some of the enemy horses and ride to safety. On June 25, 2008, Joe received two military decorations: the Bronze Star for his service in the United States Army, and the French Legion Of Honour (Chevalier Medal). Joe Medicine Crow received the Presidential Medal of Freedom (the highest civilian honour awarded in the United States) from President Barack Obama on the 12th of August, 2009. During the White House ceremony, Obama referred to Medicine Crow as bacheitche, a “good man” in Crow. Joe was the Crow Tribal Historian and a accomplished writer and he wrote two books about his people plus lecturing across the country and also making numerous appearances on television with the History Channel. Joe continued to lecture and attend cultural events right up until his death at the hospice care home in Billings on the 3rd of April, 2016. This entry was posted onSaturday, April 16th, 2016 at 3:04 am and is filed under Sydney, NSW, Australia. You can follow any responses to this entry through the RSS 2.0 feed. You can leave a response, or trackback from your own site. Both comments and pings are currently closed.